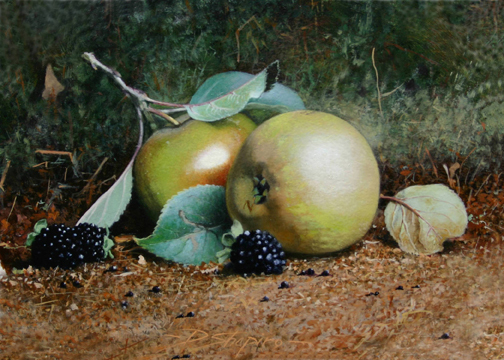 These small fruit studies make charming paintings and have proven to be popular amongst collectors. There are over 1200 varieties of English Apple, they have enchanting names: Acklam Russet, Barnack Beauty, Nutmeg Pippin, Knobby Russet…and many more. The inspiration for these paintings stems from the stylised fruit that I was trained to paint during my time working for Coalport China. Studies, such as these ‘Egremont Russet’ which I paint today, have much more realism, I have a grower of various varieties of apple locally and can set them up in the studio for working from life. There is no substitute for observation than working from nature, nature being our greatest teacher.